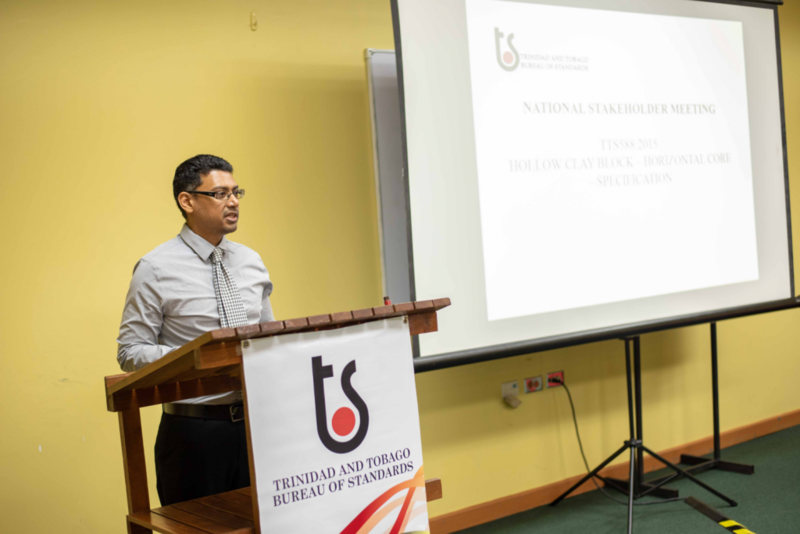 These were the words of Derek Luk Pat, Executive Director, of the Trinidad and Tobago Bureau of Standards (TTBS), as he addressed participants at the Opening Ceremony of the National Stakeholder Meeting on the enforcement of the National Compulsory Standard, TTS 588:2015, for Horizontal Core Hollow Clay Blocks. 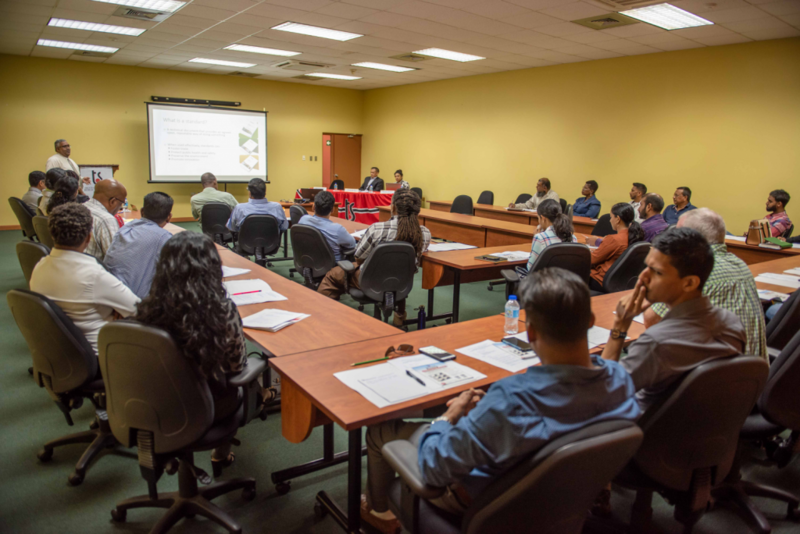 The meeting was held on Thursday 21st March 2019, at TTBS in Macoya, and included representatives from clay block manufacturers, the construction industry, regulatory agencies, governmental organizations, consumer protection agencies and distributors. The stakeholders were informed that a Moratorium Period would commence on the 21st March 2019 and conclude on the 20th June 2019. Following the moratorium, all applicable blocks used within Trinidad and Tobago, must comply with the specifications set out in the Standard. Furthermore, compliance must be demonstrated via certification from TTBS which is the regulatory authority. Certification of the blocks will ensure that construction companies, contractors, consumers and home owners will have an adequate level of protection and confidence when purchasing blocks for construction projects. These activities contribute to the development of the National Quality Infrastructure (NQI). The NQI includes all systems for standardization, testing, inspection, certification, accreditation and measurement. It is critical in ensuring that products, services and persons conform to industrial, national, regional and international requirements. As a result it also has a significant impact on National Development, Trade Competitiveness and Socio- Economic Health. 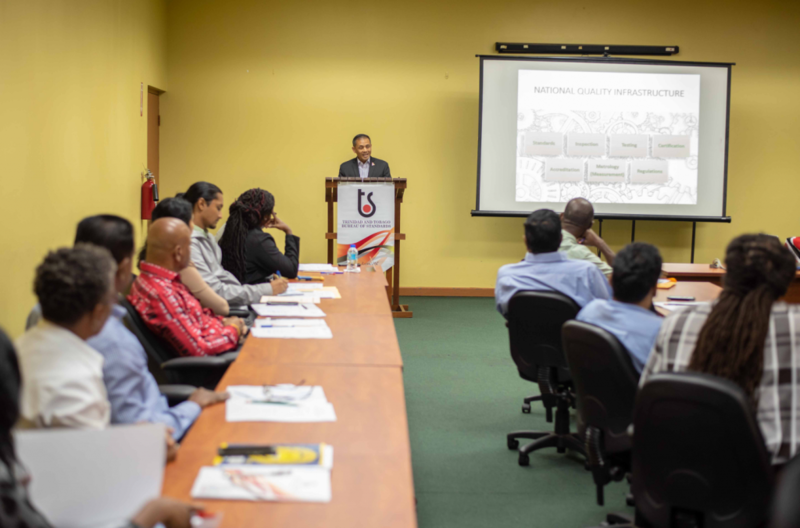 At the meeting it was noted that in regard to the development of the NQI, TTBS is assisting the Ministry of Trade and Industry (MTI) to institute the 2018-2030 National Quality Policy and Implementation Plan which was approved by GORTT in April 2018. This initiative forms part of TTBS’ mandate under the Standards Act (Act No.18 of 1997) as the National Standards Body and National Quality Certifying Body. Against this backdrop, TTBS is committed to improving competitiveness and promoting sustainable development through the formulation, promotion, and application of standards and conformity assessment activities. WELCOME REMARKS: Derek Luk Pat, Executive Director, TTBS delivers welcome remarks at the official start of the Opening Ceremony. THOROUGH EXPLANATION: Rodney Ramnath – Manager, Certification Division answers a question posed by one of the participants. FULL HOUSE: Participants listen attentively to a presentation delivered by Daryl Thompson, Standards Officer II, – Standardization Division,TTBS. 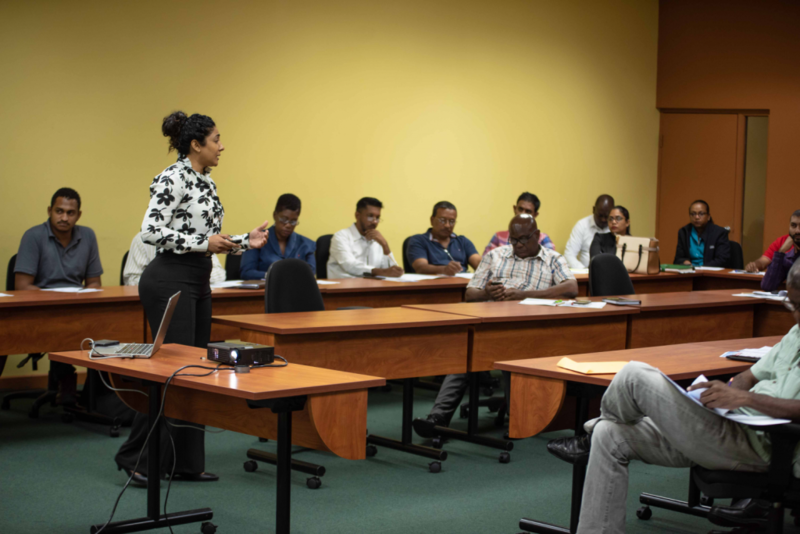 MAKING IT CLEAR: Michelle Beharry, Standards Officer II – Certification Division, TTBS thoroughly takes participants through the Product Certification process.